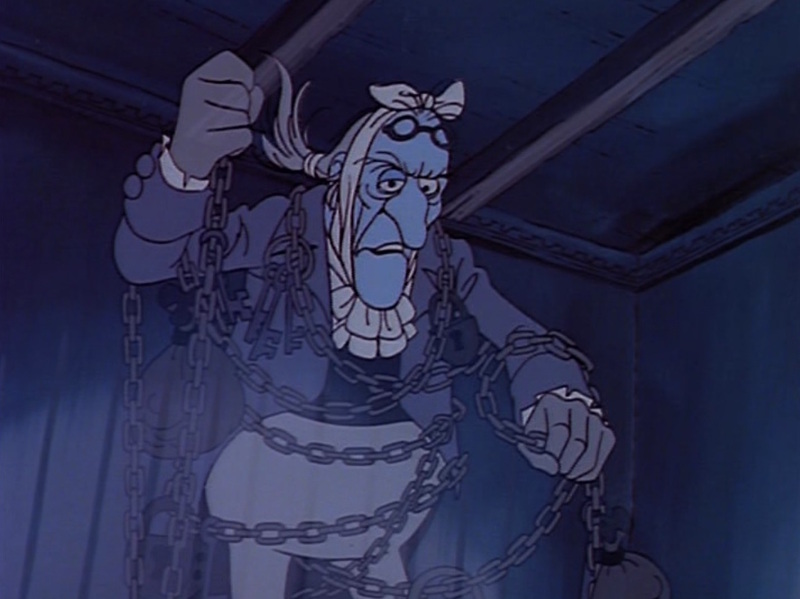 The TNT Christmas Carol did some pre-work on Jacob Marley back in the very first scene, so I was curious to see if that pays off with Marley's appearance here. Patrick Stewart's Scrooge is best characterized as isolated and lonely. That's something that he's apparently welcomed, but it doesn't seem to have always been the case. He showed emotion at Marley's funeral and expressed at least a deep respect for his friend and partner, if not actual fondness. So how is he going to react to Marley now? With shock, initially, of course. Marley's face appears as Scrooge is approaching the door to unlock it. There's some CG at work, but it's not as blatant as the Muppets version. 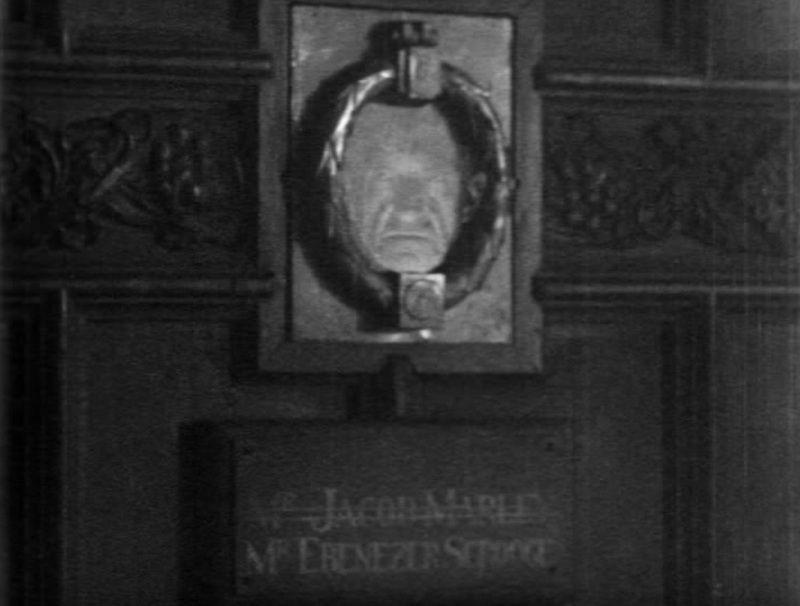 Marley's face morphs and grows out of the knocker, but the image is formed out of mist. It's clear that we're looking at a face, but its a face that's being thrust here from another world. Even Marley's scream is distant and barely audible. Scrooge can't believe what he's seeing. He says Marley's name aloud, but there's doubt in his eyes. 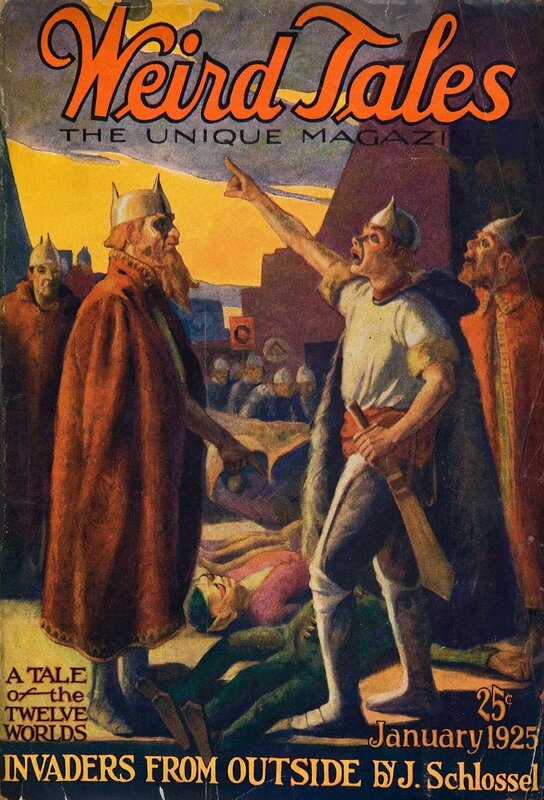 He looks back at the street as if to see if someone's playing a trick on him and his slow "humbuuug" has a tone like, "You're not fooling me..." Even if he's talking to his own mind. The interior of the house is clean and spartan and there's writing on a wall that I can't quite make out, but looks like it could be a directory of office tenants in the building. If that's right, it's a great touch. He goes upstairs (no hearse or any other spookiness) to his room, but he doesn't search it right away. He gives the interior a good look, but then just hangs up his hat and lights his fire. When he hears some old-house noises though, he gets a little spooked and checks out a tiny closet/lumber room. It's empty, so Scrooge hums a satisfied "mmm," as if to say, "I thought as much." The scene cuts to him in his dressing gown, double-locking the door to the hallway before pouring himself a watery bowl of gruel. He eats in silence until the Dutch tiles around his fireplace catch his eye. A face on one of the tiles turns into Marley's face (but still drawn in the style of the tile art; very cool) and turns to glare at Scrooge. On another tile, the entire scene becomes Marley's face (still in that same art style). Scrooge blinks and burps, trying to remove pressure from the upset stomach he believes is causing him to see things. And hear things, because after that the servant's bell starts to clang on its own before being joined by other, unseen bells and then suddenly going quiet again. 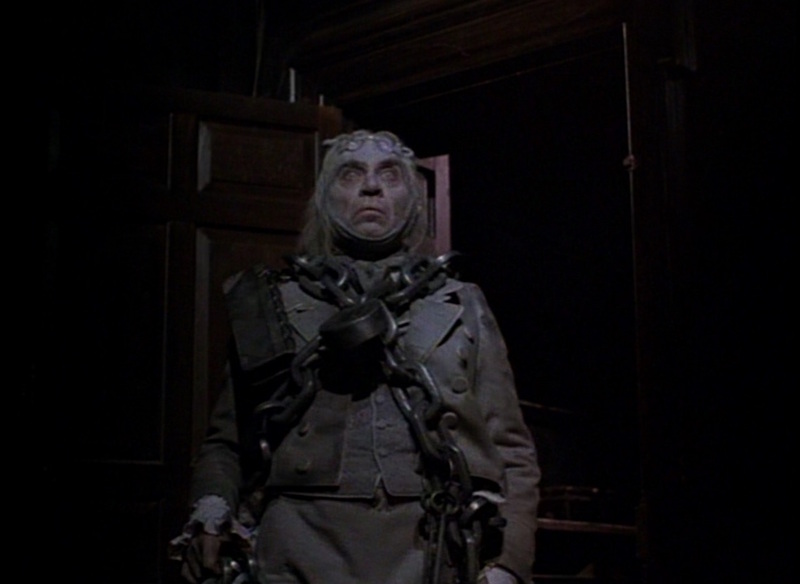 Far off from somewhere else in the house, a large door opens and Scrooge hears the clunk of footsteps and the clank of chains coming nearer. He sets down his bowl and scooches back in his chair, away from the hallway door that he now can't take his eyes off. The camera moves outside for a ghost's eye view as something comes up the stairs and moves toward the door. Back inside, Scrooge stands up and whispers that he won't believe it. In another CG effect, Marley morphs through the door like Kitty Pryde. He's all-white and see-through and a strange wind is clearly blowing his hair. Scrooge gasps and jerks back, trying to hide in a corner, but he recovers enough to question the ghost and start the conversation. Marley looks cool. Bernard Lloyd has a full head of hair and the bandage is wide enough to cover his entire chin and jaw. He looks stylish and purposeful. He carries himself sort of like a cowboy, moving his chains out of the way like Clint Eastwood moves a poncho. He even has an Eastwood squint. These are interesting choices and create a very confident Marley. Stewart is awesome too, of course. There's doubt in his eyes as he shakes his head. Marley picks up on it. "You don't believe in me." Scrooge goes back to eating his comforting gruel as he explains his indigestion and what he thinks it's doing to him. 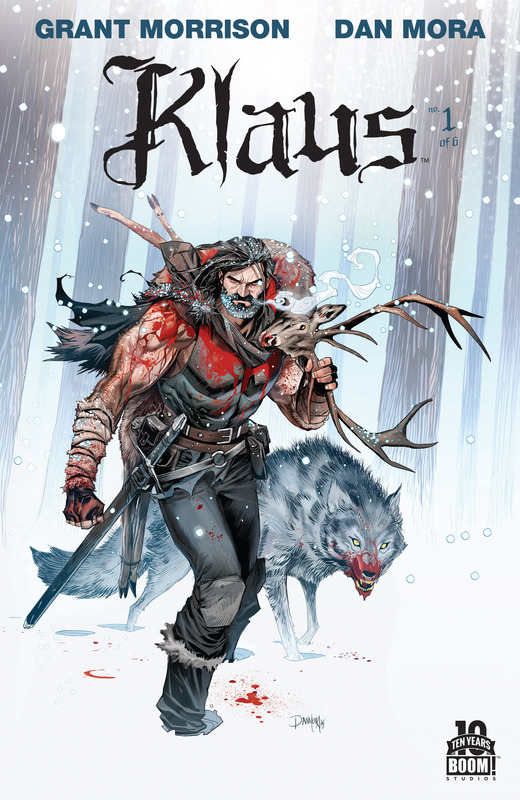 The action gives him courage, so by the time he gets to "gravy than of grave" he's sneering and adds a mocking, "Jacob!" This causes Marley to lose his cool. He stands and screams and unties his bandage, which has the apparently unintended effect of causing his jaw to open to an unnatural degree (thanks to more CG). Scrooge has to actually walk over and help Marley shut his mouth. It's this action that seems to help Scrooge overcome his disbelief. So he asks Marley about why he's come. From here, their conversation is a discussion between equals. And friendly ones at that. I can feel something of their old partnership, with Marley's concernedly warning Scrooge and Scrooge's asking insightful questions. It's a lovely scene with masterful acting. Marley is appropriately heart-broken about his own condition; Scrooge is perfect in not understanding why Marley's being punished. Scrooge doesn't even acknowledge his own guilt so much as concede that Marley at least believes in it. Because it's so important to Marley, Scrooge is curious about the "chance and hope" that Marley's offering him, but quickly becomes disinterested when he learns that it involves three more ghosts. This Marley is true to Dickens and schedules the coming spirits over a three night period. Scrooge sighs as if he's merely steeling himself for a meeting with an unpleasant client. I think he's enjoyed this visit from his old friend, but he still doesn't really believe it's happening. Marley reties his bandage with a sickening clack and I realize that it's the tightness of the bandage that was causing him to squint earlier. He walks over to the window, which opens itself, and points outside. When Scrooge goes over, he sees the host of phantoms. Some of them are flying in formation like a giant school of fish, but others are closer and seem to be beckoning to Scrooge. He watches as one, lone ghost - shackled to a huge safe - flies down to the street where a mother and her young child huddle in the cold. The ghost holds his hands out to them, but it's not perfectly clear what he's trying to do until Marley explains it. His message finished, he flies out too to join the stragglers who are making their way to the school of phantoms. Alone again, Scrooge is contemplative about his experience. It's not clear if he believes any of it, but he's not even trying to convince himself with a "humbug." 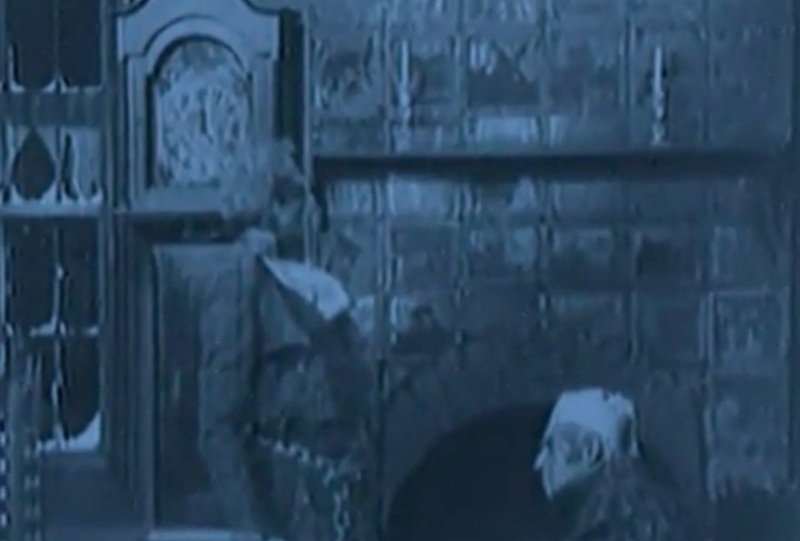 The 1938 Christmas Carol continues to make some interesting changes to the story with this scene. For one thing, Marley's face doesn't appear on the knocker right away. 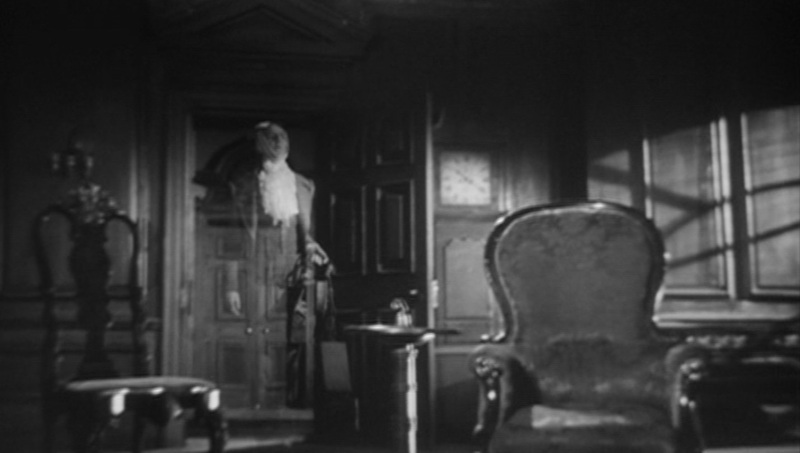 Scrooge has already opened the door, lit his candle, and is turning to close the door again when Marley shows up (superimposed over the already demonic-looking knocker). I have a theory about why Marley might delay his appearance, but I'll get to that in a minute. 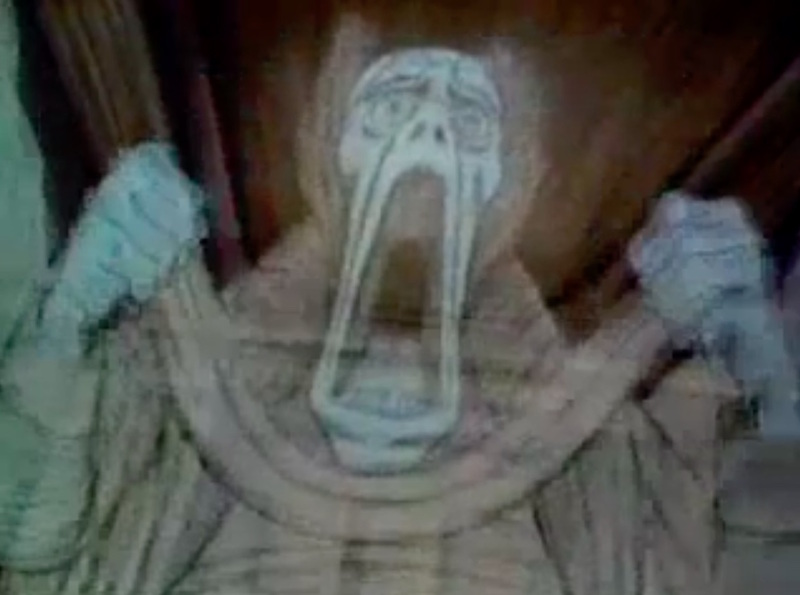 The face fades as quickly as it showed up, but Scrooge is visibly shaken. He recovers quickly though and heads up the grand, old staircase. It's pretty wide, but there's no hearse. Instead, the set design has cobwebs everywhere, giving the place a haunted house look. It's doubtful that any businesses are leasing offices in this place. Scrooge appears to be the only tenant and he's not exactly keeping up the place. He's a little unnerved, but not exactly cowering in fear. Some spooky music accompanies him as he walks and it cuts out every now and then for him to stop and look around. It's as if he notices the music and it's messing with him by shutting up whenever he tries to pinpoint its source, then starting again when he resumes his walk. In his rooms, he checks around, but with an attitude of actually trying to catch an intruder. He's not scared, he's irritated. When he locks the door, he's scowling and doing it more forcefully than he needs to, as if he's saying, "There! Try to get through that!" 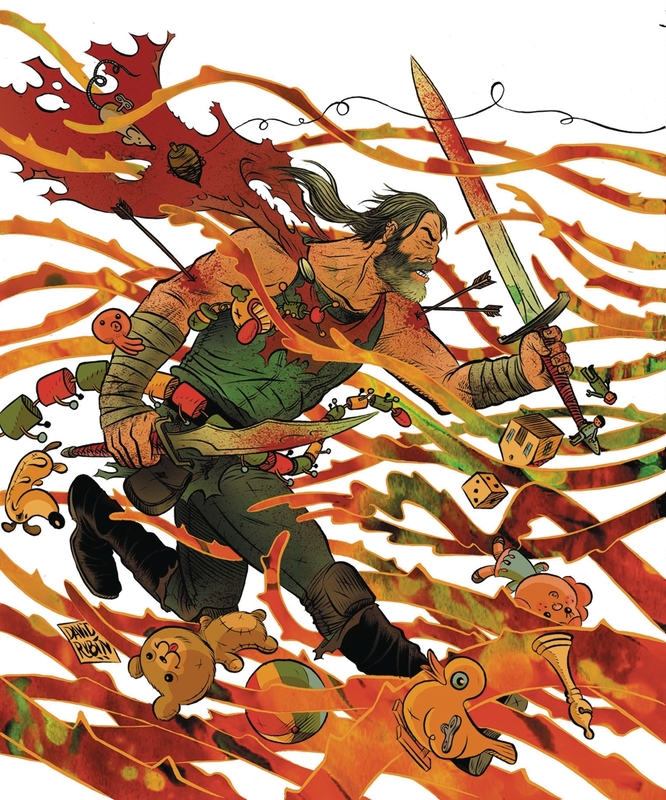 He stokes his fire a little (apparently its been burning all day, but barely) and grabs a bottle from the mantle. Since this Scrooge already ate dinner at the tavern, the movie doesn't confuse viewers with an extra bowl of gruel. Dickens explained that the gruel was for Scrooge's cold anyway, so this movie substitutes a bottle of medicine. Or maybe "medicine." Earlier, Cratchit made a joke to Scrooge's nephew about Scrooge's "cough medicine" that seemed to imply that that's how Scrooge referred to liquor. 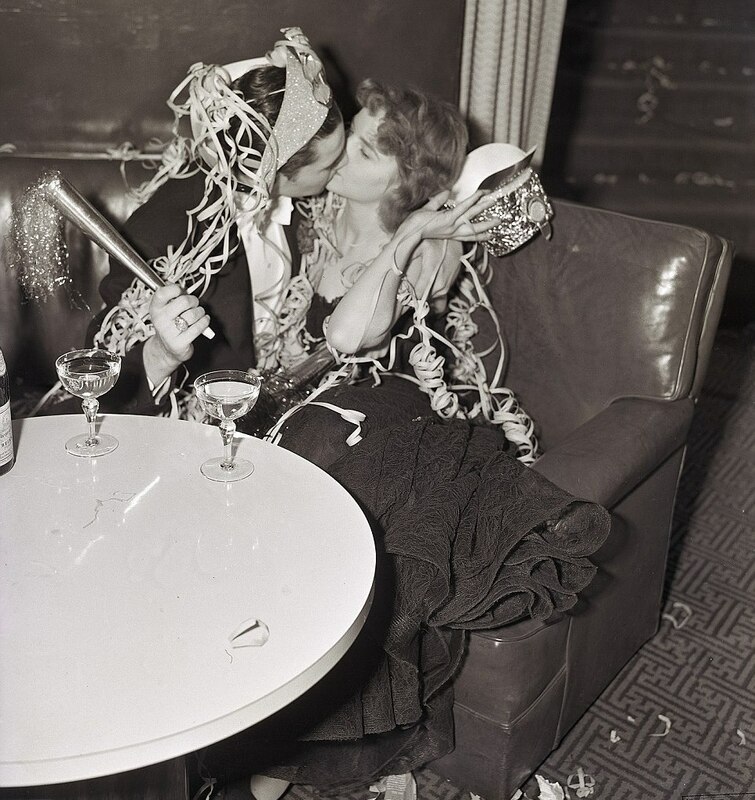 Or maybe it really was medicine, but Scrooge - too cheap to buy real alcohol - used it as a substitute. Whatever the case, we see it in action here. 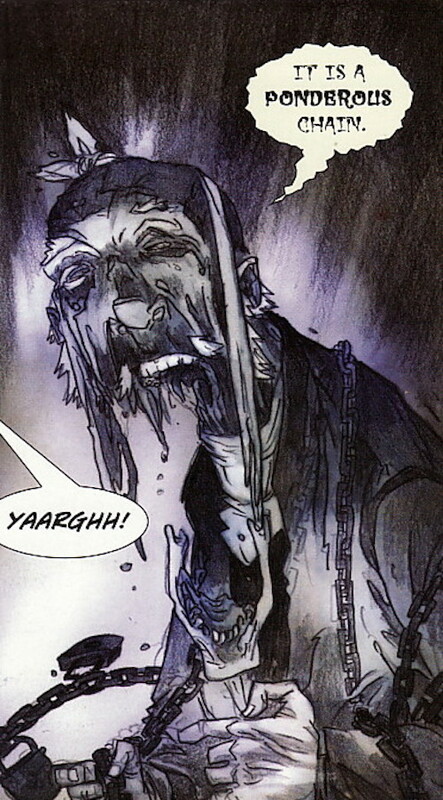 Scrooge pours himself a spoonful, takes it, then licks his fingers where some spilled onto them. He's not missing a drop. That done, he continues checking out the room. The bed is in here, but he goes through another door to get dressed. While he's out, a bell rope begins swinging back and forth, sounding the bell that it's attached to. 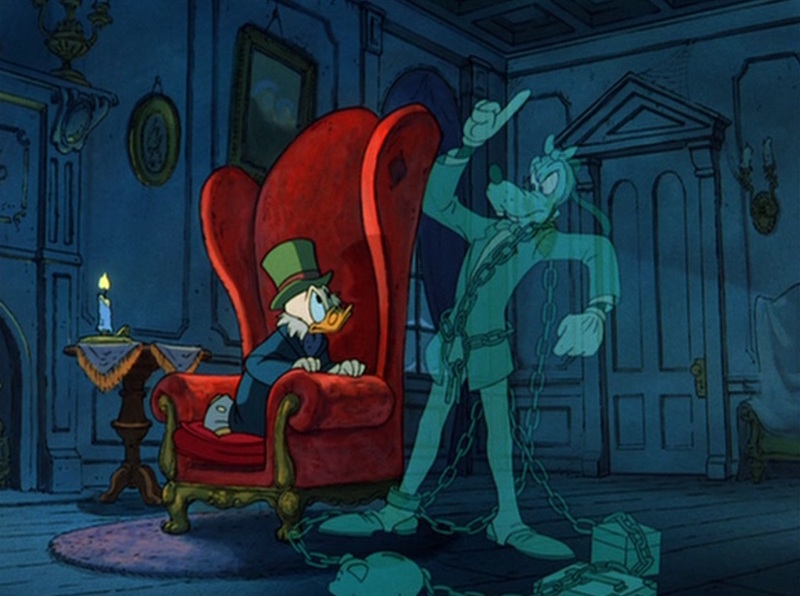 Scrooge pokes his head back into the room (he's wearing a nightcap now) and the rope immediately stops. Someone's messing with Scrooge. He whispers, "Humbug," and closes the door again, which signals the rope to start moving and clanging again. The next time Scrooge comes out (in his robe this time), the bells in the house go nuts. Scrooge's attitude during all this is more "what the hell's going on?" than fear. He's trying to figure this out, but he doesn't look worried. The bells stop, there's an immediate slamming of a door somewhere, and then Marley appears. He's transparent and wearing the bandage, but there's no sign of his personal atmosphere blowing his hair or anything. Scrooge is a little taken aback when Marley confirms who he is, but Scrooge quickly recovers and the conversation takes a very unusual tone. 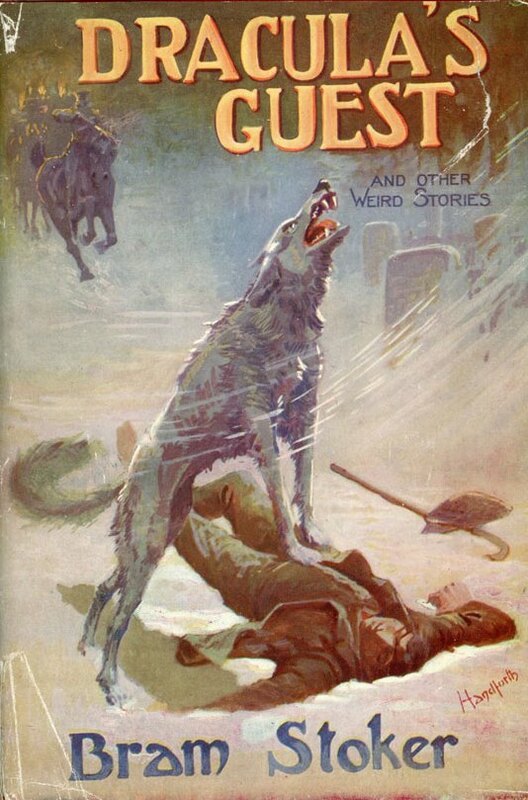 In Seymour Hicks' version, I got the feeling that Marley was the stronger of the two partners. Scrooge not only deferred to him during their talk, he also seemed upset when Marley left. Reginald Owen's Scrooge is the opposite of that. He fusses at Marley the way he fussed at Cratchit earlier, giving the impression that it was Scrooge who dominated the relationship when Marley was alive. This makes me wonder if Marley's delayed appearance at the door may have been evidence that Marley himself is a little afraid of Scrooge. Or at least not super eager to have this conversation with him. He could be doing it out of compassion (or penance, if we're less charitable towards him), but still not look forward to it. Scrooge talks about Marley's possibly being a digestive issue, but there's no humor in it. He doesn't even use the gravy pun. 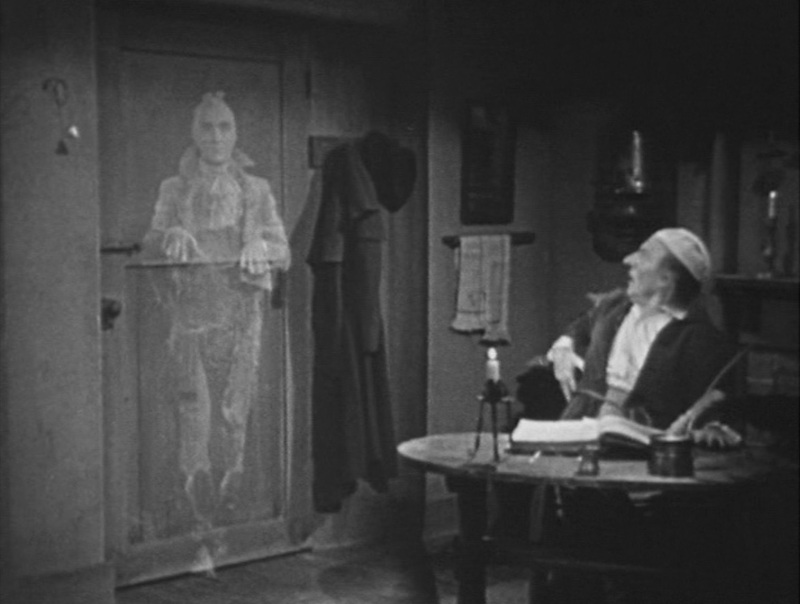 Marley's answering moan is pitiful, not threatening, and Scrooge orders the ghost to be quiet. At this point, the film adds something completely new to the scene. 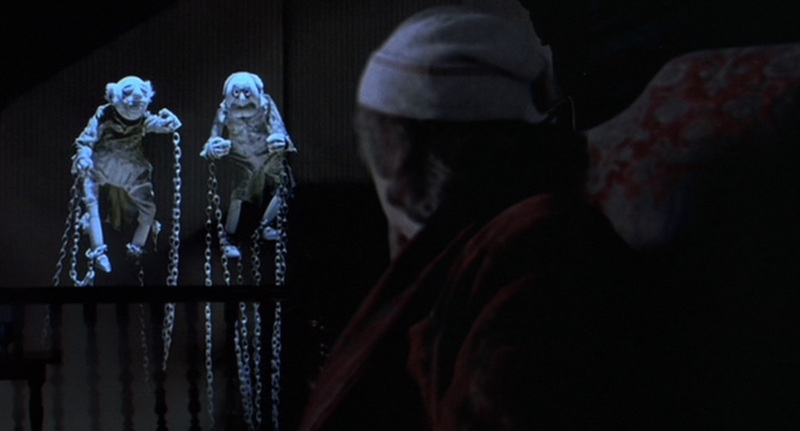 Scrooge hears the night watch in the street below, so he goes to the window to call them up. They come to his room to investigate, but of course Marley has disappeared. 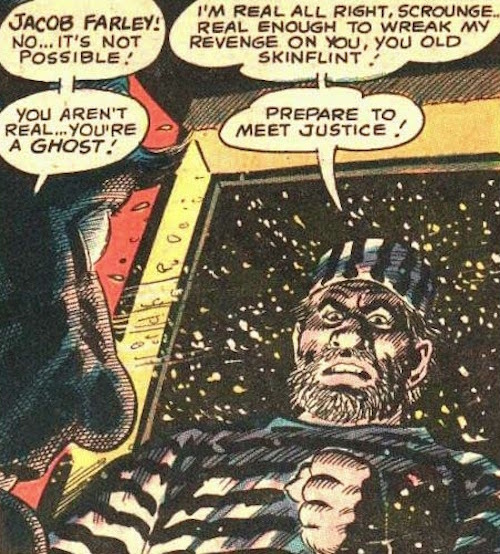 After the watchmen make some jokes about Scrooge and spirits ("of one kind or another"), they leave and Marley returns. The effect of the incident is to break whatever spell Scrooge thought he might be under. Somehow, having Marley still there after the sobering conversation with the watchmen makes Scrooge realize that he's not hallucinating. Scrooge concedes that he must believe in Marley, but he's still not afraid. He's just as grumpy and demanding as before. To be fair, Marley doesn't appear to be afraid of Scrooge either. He's confident in his mission and he forges ahead, but it's so odd to see Scrooge stand up to him. As they continue talking, Scrooge begins to soften towards his old partner some, perhaps taking some comfort in the renewed relationship. 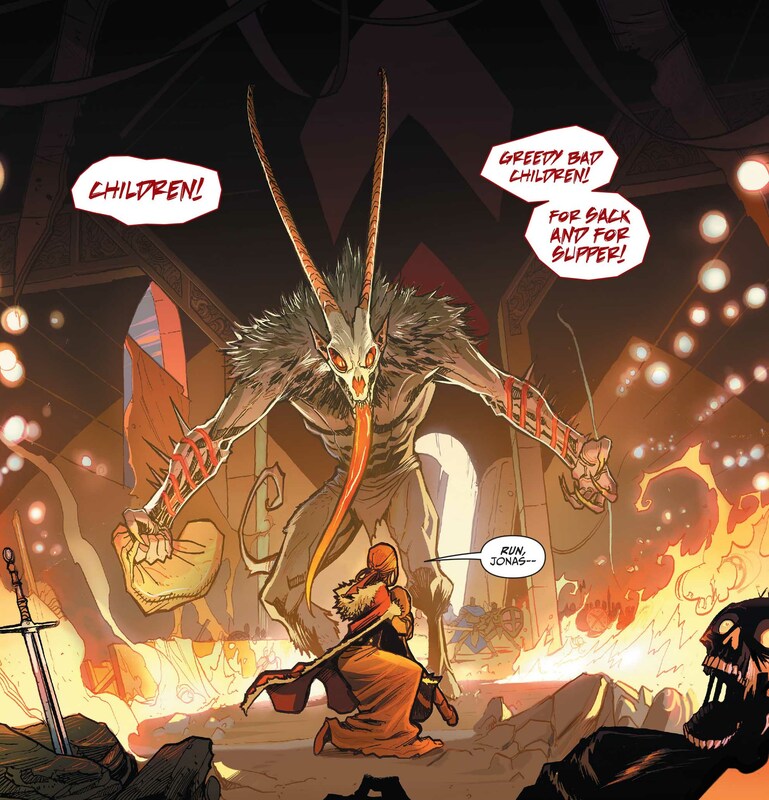 This version of Scrooge has already showed signs of wanting some human connection. He seems to hear what Marley is saying about the future and the need for Scrooge to change. But unlike the other versions, it's Marley's words that are having the biggest impact, not the way that he's delivering them. It's like he's confirming something that Scrooge has already known or suspected about himself. Scrooge never drops his wall though. He dismisses Marley and his chance at redemption. 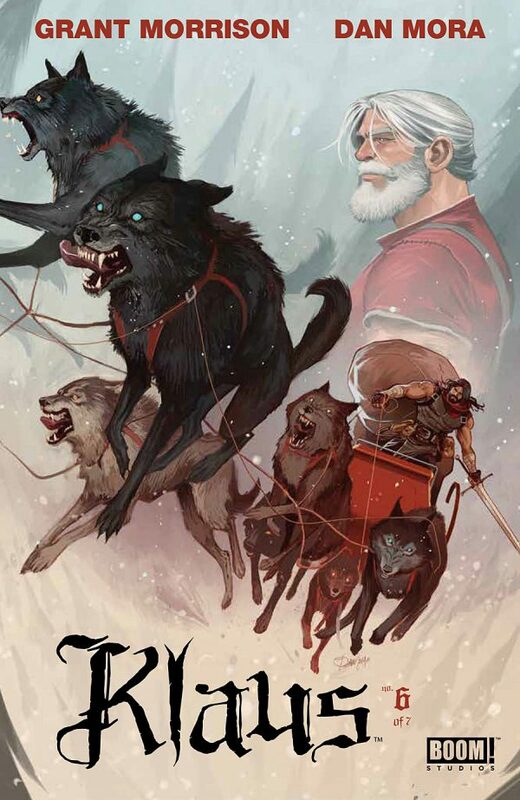 At least until Marley mentions the three spirits that are coming. That unnerves Scrooge a little and he asks Marley to stay, presumably to explain further. Marley's already heading for the window, but he reveals that the spirits will all come that evening: one an hour between 1:00 and 3:00 am. He even repeats the schedule, accompanied by bells chiming the times as he says them. And then, standing by the open window, he disappears. This version cuts out the phantoms in the street. Scrooge is nervous now, mopping his forehead with his handkerchief and quickly closing the window. He doesn't even try for half a "Humbug," but jumps in bed and pulls the curtains. He could deal with Marley okay, but he's not at all excited to see what's coming next. Richard Williams' animated version does have a transition from the knocker (another lion face) to Marley, but it's so quick and subtle that I didn't even notice what was happening until the change was done. The designs of the knocker and Marley's face are so similar that only a few lines have to switch and it might as well have been without "any intermediate process of change." Scrooge is shocked by it, but the transformation back to knocker again is just as quick. Inside, a ghostly hearse does go up the stairs and Scrooge is startled again. But he quickly recovers with a "humbug" and continues to his rooms. The animation is great in this sequence with most of the screen in darkness except for Scrooge's face, which is illuminated by his candle to an almost spectral appearance itself. Makes the whole house feel very creepy. Scrooge continues to mutter "humbug" all the way to his quarters. The film doesn't have Scrooge searching his rooms or locking his door, but goes straight to him in his nightclothes, eating gruel by the fireplace. It's a faithful rendition of the room in which Scrooge's fire is nothing more than a glow and the hob is clearly visible with Scrooge's saucepan resting on it. I can't tell that there are any Dutch tiles, but the movie skips the second appearance of Marley's face and goes straight to the ringing bells. Instead of bells all over the house, it's just a trio of service bells that stop abruptly so that Scrooge can hear the clanking of chains. Instead of Scrooge's fire acting strange, his candle flame flickers unnaturally as Marley materializes through the closed door. Marley is transparent and does have a personal atmosphere that blows his hair and clothing around. 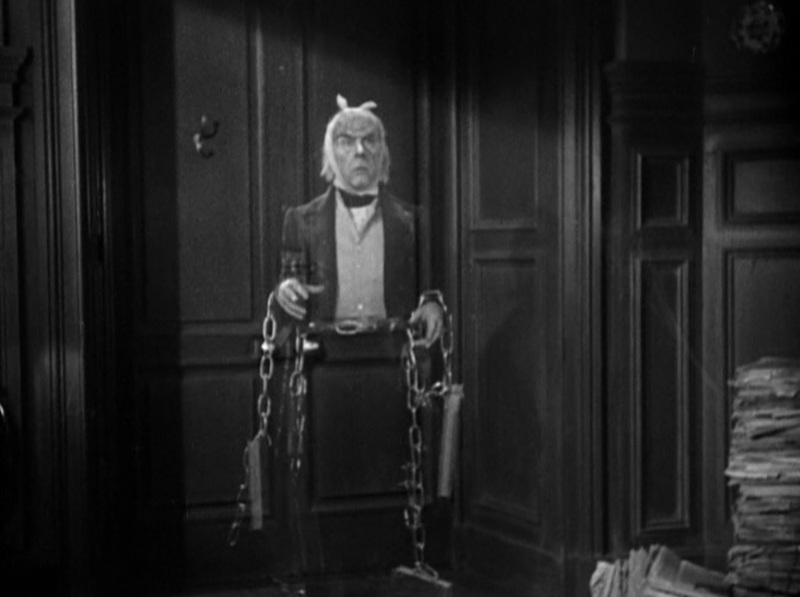 Thanks to Alastair Sim's voice talents, Scrooge's joke about the gravy does come across as whistling in the dark, which causes Marley to take things to the next level. When Marley pulls off his bandage, his jaw gapes to an unholy degree. He screams loudly and Scrooge cowers, terrified. As the conversation continues, Marley does speak in a spooky monotone, but even spookier is that his mouth never moves. It just continues to yawn widely with Marley's voice coming from deep inside. Scrooge is no longer the cold, passionless man he was in the earlier scenes. He's obviously frightened, but I also detect a hint of respect for his partner in the way Sim has him address Marley. Scrooge doesn't get to talk much, though. Marley schedules the ghosts (over three nights) and then flies through the window with a shriek. He joins a host of other phantoms as Michael Redgrave's narration kicks back in, describing the ghosts' misery as they uselessly stretch out their arms to a mother and child sitting in the snow below. Scrooge doesn't even get his allowed half-humbug out. Scared out of his wits, he simply runs to his bed and quickly draws closed the curtains.